DNA is charged negative because of its phosphate backbone. Since charges need to be balanced (so that there are no charges building up somewhere), what is the positive charge which neutralizes this negative charge? DNA in the body is not available as a free molecule, it is organized around DNA binding proteins, mostly the histone octamers. These proteins carry positive charges (mostly from lysine side chains) which interact with the phosphate backbone of the DNA. It is like in the figure below, the charges play an important role in the tight packaging. See here for more details. The charge (or the temporary neutralization at some points of the DNA) is also important for the regulation of the DNA. 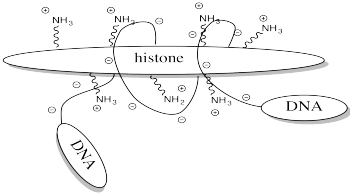 Acetylation neutralizes the histone tail and loosens the DNA-protein structure (see here for more information). Positively charged ions don't play a role in neutralizing the DNA charge in living cells (this is different for precipitations), as both are solubilized and split into ions. The concentration of positively charged ions like sodium and potassium are tightly controlled by the cells, as they are important for the function of transporters (for example the sodium-glucose transporters and others) or for keeping up membrane potentials. Moving the ions, which have to neutralize the DNA charge around would lead to a polarized nucleus. Your cells have a high concentration of sodium ions that are positive. Other important cations are potassium and calcium. Additionally, many amino acids are positively charged at physiological pH. DNA is not the only source of negative charge in your body, other amino acids are negative, and most cell surfaces are negative as well. The interactions between charged species play an important role in many biochemical processes, but at the end of the day, and for the whole organism, the charges are all pretty much balanced out. The negative charge in DNA is localized to individual oxygen atoms in DNA. This negative charge is balanced by positive ions in the body. In the case of a magnet or molecules with a dipole, negative and positive magnetic field lines align to produce an overall magnetic field. DNA has many small dipole moments but none across the entire molecule. In the case of a neuron, an excess of negative charge inside the cell and positive charge outside the cell is maintained by the diffusion gradient of potassium and sodium across a membrane. An overall electric potential is not created with DNA.